Silverfern Backpackers is a new and friendly hostel with excellent facilities, including three lounges with 50 Inch Plasma TV's - one especially designed for movies and sports with Igloo TV. We have a very spacious lounge to relax in with WiFi available throughout the property. Guests will receive free high speed WiFi on their arrival (Book for a week and receive 1GB of free WiFi!). All rooms have opening windows and natural light. 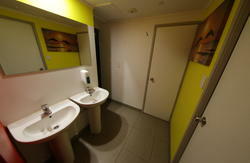 Our hostel has been specially designed for comfort with all new furnishings. A games room with a pool table and internet facilities are available as well as an outside courtyard with BBQ facilities and seating areas. Our modern kitchen has ovens, microwaves, cutlery and cooking utensils for our guests to use. A spacious and highly comfortable dining area is also attached to the kitchen. Our free breakfast is served from 8am to 9am (During winter June to October). Car parking and bus parking facilities are available on site. Trips and tours, along with campervan rentals and car rentals, can be booked at reception. Backpacker Car Insurance can be arranged immediately at Reception. Immigration Services (Work, Student, Visitor Visas and English Language courses) can be arranged at the hostel. We are close to supermarkets, banks, cinemas, Queen St, Aotea Square, K-Road and the Sky Tower. 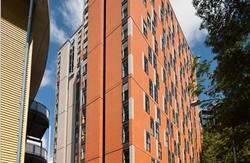 There is a maximum of 3 nights' stay in the 12 & 14 bed dorms, then you must upgrade to an 8 bed dorm. Please note that guests over 45 years of age must stay in a private room and are not permitted in the dorms. Coming from the airport use Super Shuttle for door to door service. We are located 350m from the Bus station at Sky Tower Casino. RECEPTION CLOSES AT 10.30PM PLEASE ARRIVE BEFORE THIS TIME.